Typical Cost is $20 per Agent per Month inclusive of all system features, That's IT! Starter Package from $9 per month for solo users, Premium users cost $30 / Mth including our DataMine Service. Calls can be logged from internal staff, customers or the general public. Self Service problems can be logged from internal staff, customers or the general public. New Tickets automatically generate confirmation Emails which are sent to the originator. Tickets can also be printed and issued to staff in PDF format for them to resolve. Ticket updates can be sent as SMS text message alerts with active URL links to the originator. Tickets can be sent to Field Engineers using SMS alerts with active URL links for scheduling. Field Engineers can make status updates directly on completion using their Smart Phone. Ticket Reporting can be exported to Excel and automatically distributed to Email Address Groups. Email address Groups can be formed from staff, customers or third party users. Tickets can be tracked by status, priority, queue, the "assigned owner" and third party support organisations. Service Level Agreements (Target Response Times) can be defined by site, department, or customer - combined with priority - automatic profiling at the time of Ticket entry. Tickets have many user defined analysis fields and data entry fields to suit any requirement. Supervisors can track outstanding calls from registration through to completion. Self-refreshing enquiries display Response and/or Fix Targets with most urgent at top of screen. Allows supervisors to keep on top of contracted SLA's. Known problem consolidation - a top level control ticket can be raised allowing all related tickets relevant to this known problem to be linked. When the problem has been resolved all the related issues can be marked as resolved and then completed when the originator has been informed. Tickets can be updated with comprehensive notes & file attachments, such as product images, or documents sent in by callers. Announcements can be input which display on screen for Staff, Customers & Third Party users when they log in. Service Level Agreements (Target Response Times) can be defined by Site, Department, or Customer, any defaults can be overriden. Target Response Times always take into account your service hours and all Bank & Department Holidays. Tickets can be passed directly to third parties, who can have system access to update their own Ticket status. Remote Users or Customers can Login to REGISTER THEIR OWN Ticket or track the progress of those already in the system. A User defined Knowledge Library is available for anyone to research known problems with known solutions. An auto refreshed Dashboard provides a summary view of outstanding Ticket Status, detailing Tickets on hold, & due to hit Target Times today. Enquiries by Ticket status, priority, queue, owner, third party, staff member - filter by multiple selectable fields. Multi-Level history of Tickets by week or month - opened/closed/balance/fix type/user/department/etc. Diagrammatic Call graphs by day within the chosen month showing calls taken and closed. Performance summary by year & month for calls opened & closed analysed against their SLA with success rate. Staff Performance can be analysed by call type, site and department. The system is completely configurable according to each clients internal process and procedures. Issues can be reported 'Self Service' from internal staff, customers or the general public. Tickets can be issued to Engineers using SMS Alerts directly to their Smart Mobile Phones. Engineers can update calls on completion using their Smart Phones. Ticket notices and updates can be sent to call loggers using SMS alerts with active links. Filtered Ticket Reports can be generated in Excel format and issued automatically to Address book groups. Teams can be created using Email Address groups used for ITIL problem management. Tickets have many user-defined analysis fields and data entry fields to suit any requirement. Tickets can be updated with comprehensive notes & file attachments, such as equipment images, or word documents sent in by callers. System Announcements are provided, these display on screen for anyone who accesses the system. Service Level Agreements (Target Response Times) can be defined by site, department, or customer - combined with priority - all can be overidden at the time of Ticket entry. SLA's always take into account your operational service hours and all Bank & Department Holidays. Tickets are sent directly to third parties - who can log in to the system to update their own Ticket status. Remote Users or Clients can log in to REGISTER THEIR OWN CALL or track the progress of those previously reported. The User defined knowledge Library can be used by call loggers and Customers to look up known problems and apply the solutions found to resolve their own issues. The auto refreshed Dashboard provides a summary view of the status of all Tickets in the system - outstanding, on hold, unassigned, third party, opened & closed. Enquiries are provided by status, priority, queue, owner, third party, staff member, filters by site, department or any of the user-defined analysis fields. Reporting provides a Multi-Level history of calls by week or month - opened/closed/balance/fix type/user/department/etc. Performance summary by year & month for calls opened & closed - analysed against their SLA showing success rate. Staff Performance can be analysed by call type, site and department, etc. 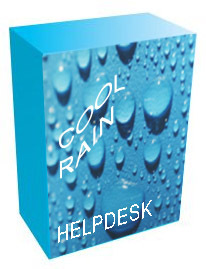 'Coolrain' is an advanced web application service that will be useful in many organisations - a complete packaged Ticket Management System which can be used by an internal ITIL based Service Desk, or any variant of Help Desk, it can even be applied more generally within a project for issue reporting and control. Complete with all the latest 'Self Help' and Social Media features Coolrain is designed to reduce the level of direct support needed to end users and improve their experience of the help desk service, leaving the support agents with more time to provide direct help. User Self Help is provide by end user Forums, Frequently Asked Questions, and 'Self Logging' of calls when they are unable to find their own answers. Users can log problems (using a browser form) choosing their own priority, any critical 'Out Of Hours' problems can raise trigger alerts via SMS to your key support roles. This feature works on every smart mobile phone. End users can also simply Email the Service Desk problem reporting Email Address 'support@...' when Coolrain will automatically create a Call Log pre-filling key fields with the information taken from within the Email body. This Feature adds to the whole range of end user 'Self Service' facilities, and will be of particular use when there is no telephone support service provided. Coolrain comes complete with an in-built CHAT facility, where anyone who is logged in can join pre-allocated chat Rooms which can be set up specifically for particular incedents, ideal for ITL focussed processes. Coolrain is provided as a fully managed on-line service which we host on your behalf via the Web (using the PaaS model), you need not worry about backups or any other operational aspect - just connect and go!. Using the 'White Label' options you can provide an integrated look-n-feel for your support requirements. This fantastic 'PAY-AS-U-GO' application is delivered as a cloud service, you can utilise our managed PaaS (Platform_as_a_Service) platform, or we can host the application on your own dedicated server, this approach is termed 'SaaS' meaning "Software As A Service". You choose the model you prefer, either way it is simple for you to access and requires no purchase of hardware or software by your organisation. It is now possible to operate a geographically dispersed Help Desk Ticketing service with a ZERO start up cost, people can access the system from any location, operators can work from home, using their own PC or even a PDA. All that is required is a telephone and Web access. A very useful feature is complete Smart Phone compatibility, this means that you can issue trouble tickets to support engineers via SMS text alerts, wherever they are. Using their mobile phone they can update the status of each issue the instant it is resolved. Another benefit of SMS integration is that anyone who reports a problem can be notified of the Ticket details via text message, they can then check the status of their issue from anywhere, with a simple 'click', meaning less phone calls - and more 'Self Service'. SMS text messages are the perfect facility for the 'Out of Hours Alerts' feature, which is activated when ever the 'Self Logged' call facility is used by a client, and they choose one of the critical priorities configured in the system, key support roles can see full incident details on their smart phone within seconds of a user log being created, allowing immediate action to be taken as required. To facilitate ITIL problem management, Coolrain provides a complete Excel formatted group export to distribution lists detailing all incidences of problem details to the appropriate team, with calls to action and problem allocation to those roles who need to resolve issues. To integrate with existing systems a full set of Data Import options are included, and you can provide automated End User Surveys directly off the back of closed calls via our integrated 'Micro Surveys' facility, so you can always be aware of those end user views. If required there is a direct API facility provided for integration into any central ERP systems where needed. Because the application is totally cloud based, access can be provided to all the players in the process, whether they be third party vendors, organisation members, or customers, and they can use whatever device they choose to gain access. Deployments can begin with just a few users, which can be increased as demands require - you only pay per Agent user of the system at a nominal value of $20 each per month for the full system*, those people who need to have 'view only' access to the system - users who are not actively logging tickets , do not attract the per seat Agent charge. So you can provide unlimited access for your own remote employees, and critically, direct access for Third Party service users who are able to update their own ticket status. With this low entry cost, you can support any number of internal end users, or remote customers and clients, they can use any type of desktop PC and ADSL service, and because of the low bandwidth requirements, access can also be provided out on the road, by using the latest Smart phones or PDA's over any reasonable 3G signal. You can get started very simply, there are no long term contracts to cause concern, no equipment to purchase and the application screens are fully supported by a comprehensive "help-me" system - all backed by telephone support, so your team can get started and begin using the system with very little training or local hands on support, now you can get started with the least amount of effort and cost. If you wish we can even arrange for the application Database Tables to be replicated back to your own servers, so you can keep an eye on your own data (even though we back it up 3 times using different services). So you really do not need to worry about anything - other than servicing your clients calls and resolving their issues. Of course if you can see the data, you can develop your own reporting ... very neat. This Cloud Help Desk application is owned and operated by ourselves, its design is based upon many years of experience in the support world - even so, we expect that someone will always want new features, so our policy is to release a new version at least once a year, when the new features provided will be made available to all existing users. Take a look at our Services section to see how your organisation can benefit from our secure and reliable solutions.